Wow, what a shot of that incident. I’ve seen that crash from several angles and the angle where you can see the Flanker just cart wheel across the ground is just unreal. 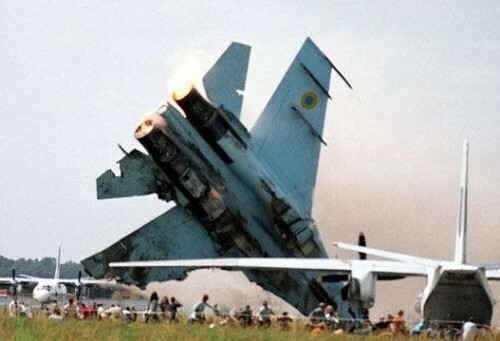 From the amount of damage on the wings & tail, I’d almost guess it’s in the middle of a 2nd or 3rd cartwheel but wouldn’t the whole jet just have exploded the moment the nose hit the ground? I have a picture of the other side of that, the pilot is just ejecting out of the plane, not sure how to post it here though. Horee cow! That pilot needs to sit in the wheelchair toilet!